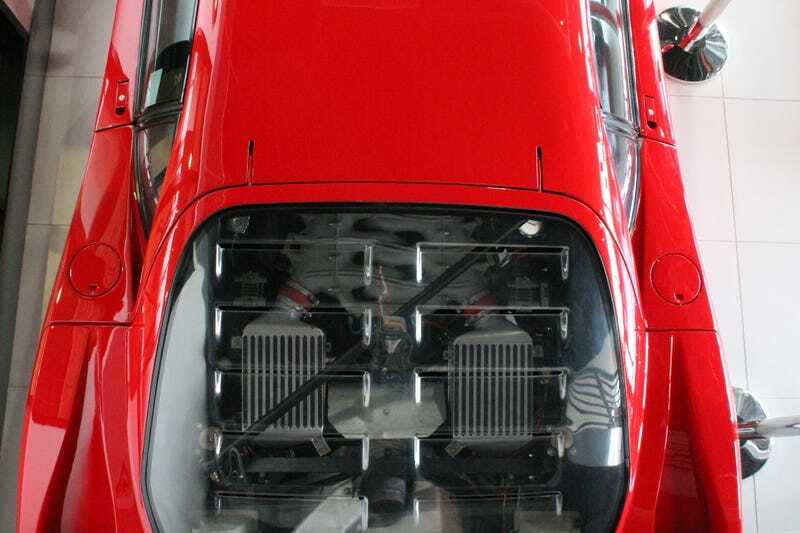 Tucked behind shiny new Californias, 458s and all manner of Ferrari-branded merchandise at Ferrari of Austin is a time capsule: a 1992 Ferrari F40 with only 172 miles and the factory sticker still stuck in the front window. The dealership has been holding it for a customer who is stuck with the task of building a garage capable of containing pure awesome within its walls. This is the Ferrari dealership between my apartment and my usual coffee house in the morning, so I've honestly become a bit numb to it aside from "oh, those are nice" or "I wouldn't mind having a red 458." One day, as I was half asleep in zombie mode on the way to caffeine, something appeared in the corner of my eye that did grab my attention: OH. MY. GOSH. THAT IS AN F4o. Why would the F40, of all things, get my attention over any of the others? Several reasons, actually. There's the fact that it's incredibly rare. It's also a car from my childhood — one of the first supercars, poster-fodder for fourth graders with awesome taste, and available as a Matchbox car that I used to push around with its big, huge wing. Most of all, there's the sheer insanity of it. It's a racecar for road use much more so than the modern cars around it. The others in the showroom look like comfy cozy commuters that may tolerate a trackday every now and then in comparison. It's simpler technologically, yet much wilder in its design — a large curved wedge shape with NACA ducts all over, a wing large enough for the entire cast of "Northern Exposure" to eat breakfast off of, and a huge louvered piece of plexiglass that reveals a turbocharged V8. It's very sinister looking. It'll probably kill you if you just look at it funny. I can respect that. Perhaps the most striking thing about this car in particular is its condition. The car was put into a collection shortly after its purchase, and its owner has left on the original seat covers and price sticker on it for safe keeping. 12 MPG! Kevlar-carbon fiber body panels! Air conditioning! Oh, and a roll bar for good measure. While part of me laments that this car hasn't been hooned like the universe intended it to be hooned, I can appreciate that the owner kept this one spotless for posterity's sake. Also, I still want one — but that goes without saying.